We’d love your help. Let us know what’s wrong with this preview of Ranger Rick by Stacy Tornio. To ask other readers questions about Ranger Rick, please sign up. 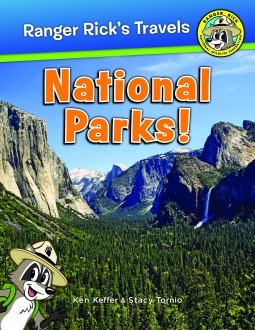 Ranger Rick goes to the National Parks by Ken Keffer and Stacy Tornio is a very useful resource for children and their parents who are or might be planning a trip to any one of the National Parks. The parks are broken down by geographical location. A brief history of the National Park System is given as well as an explanation of why these parks are so important to us. Each separate park is also described by location, history and size. 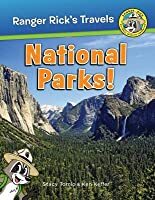 Several important things to lookout for are listed with each Ranger Rick goes to the National Parks by Ken Keffer and Stacy Tornio is a very useful resource for children and their parents who are or might be planning a trip to any one of the National Parks. The parks are broken down by geographical location. A brief history of the National Park System is given as well as an explanation of why these parks are so important to us. Each separate park is also described by location, history and size. Several important things to lookout for are listed with each park followed by 5 things the child and family should plan on doing in the park. Also included are many beautiful photos of the parks and the animals. Reading through the book, it is amazing how many parks make up the National Park System. With the 100th Anniversary of the American Park System, this book would make a wonderful gift, or an excellent addition to a families vacation planning. It would allow a child to help with the planning and give him his own guidebook to follow. It is filled with wonderful, easy to understand information and beautiful pictures for children and their families. I received a copy of this book from Netgalley and Rowman & Littlefield Muddy Boots in exchange for a fair and honest review. Ranger Rick National Parks! by Stacy Tornio and Ken Keffer is a wonderful bite size trip into many of the US National Parks. Anyone who enjoys reading the Ranger Rick magazine would love this book. While it does not go into great depth on any one park, the book gives just enough information bites to pique any child’s curiosity. I liked the magazine format of the pages with the photographs. The type of information chosen would be perfect for elementary readers. Not too wordy but not lacking either Ranger Rick National Parks! by Stacy Tornio and Ken Keffer is a wonderful bite size trip into many of the US National Parks. Anyone who enjoys reading the Ranger Rick magazine would love this book. While it does not go into great depth on any one park, the book gives just enough information bites to pique any child’s curiosity. I liked the magazine format of the pages with the photographs. The type of information chosen would be perfect for elementary readers. Not too wordy but not lacking either in the information, just a right balance between text and photos. As an elementary educator I appreciate the interest that this would generate for readers. I enjoyed the top fact, top things to do, and what to watch for. I also like the set-up of the book with over 50 parks listed by regions with an easy to read clear map. Having visited several of the parks, I think it is right on the money and also worth the money for young readers to be “arm chair” explorers through reading this book. Ahh...the National Parks, I love them! Making it to all of the National Parks is on my bucket list, but I haven't gotten a passport. I've been to several of the parks, and this book would have been mighty handy, especially with kids. I will definitely have to purchase to keep with us on the next trip and recommend for our library to purchase. Thank you to NetGalley and Rowman & Littlefield Muddy Boots for an advanced copy in exchange for a fair and honest review. It is great that all of the U Ahh...the National Parks, I love them! Making it to all of the National Parks is on my bucket list, but I haven't gotten a passport. I've been to several of the parks, and this book would have been mighty handy, especially with kids. I will definitely have to purchase to keep with us on the next trip and recommend for our library to purchase. Thank you to NetGalley and Rowman & Littlefield Muddy Boots for an advanced copy in exchange for a fair and honest review. Ranger Rick's Travels: National Parks! by Stacy Tornio is a book that is colorful which will help children appreciate the beauty and diversity of the United States. The book is categorized within the different regions of the country and then showcases National Parks within that area. Every National Park is mentioned. The pictures and facts about the parks are a great way to teach children about America. The book catches the attention of children and adults. I would love to include this book in my classroom for when teaching American History. For example, if I am talking about California I could show the students a park from that region or if we are discussing about New England I could do the same. This book is a great resource whether teaching 1st grade or 8th grade. 1. I'm a giant nerd with the National Parks Passport and am making it my mission to hit all the major spots (by the way, nerds are a GOOD thing). 2. I have a 4-year-old niece who I'm dying to take traveling (the hurry for her to grow up is in direct violation of the need for her to never grow up). Nice introduction. Like the namesake magazine, information in this book is sparse. Readers looking for more than just a brief glimpse of highlights on individual parks will need to look elsewhere. Sadly, I could only speak from experience re two of the parks, the Great Smoky Mountains and Mammoth Cave. While I personally want more information than what was given, I could see this book being a nice, general, quick read for elementary students whose families are planning to travel. This book is full of interesting information and beautiful photographs. I received an ARC from NetGally.